A woman has left £2m to a Cornish lifeboat station to pay for a new boat. The money for the Padstow lifeboat has been left in the will of Heather Allen, a member of the family which founded the Beefeater gin company. Miss Allen, known as Mickie, lived near Padstow. She died in August in her 80s, leaving £9m to her charitable trust, £2m of which is to buy the boat. The Tamar class vessel should be in action by next summer, working out of a new boat house which is being built. 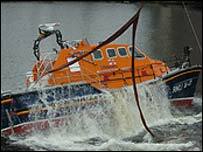 The present lifeboat, the Tyne-class James Burrough, was also paid for by Miss Allen. The 31.5 tonne Tamar class vessel will be 52ft (16m) long, have a crew of up to seven people and will have self-righting capability if it capsizes. It will have a top speed of up to 25 knots (28.8mph), and on-board computers. The total cost of buying the new boat and building the new lifeboat house and slipway at Trevose Head, one of Cornwall's oldest lifeboat stations, is about £5.5m. There have been more than 16 lifeboats in four boathouses at Padstow since 1827. Station mechanic Michael England said there had been many changes since the first days of the station. He said that, even by the early 1900s, the lifeboat men were lucky if they had a lifejacket made of cork. He said: "They would have launched in the pitch darkness, with little idea of what they were going to. "The clothes that they stood up in were probably the only clothes they had, and they would have launched into a heaving, boiling sea pulling on an oar. "It would have been hard enough holding on to an oar, let alone trying to make any distance with it."